2x4 Basics, the company that brought us the simple 2x4 shelving system, is ready to prepare us for a season full of fireplace use. 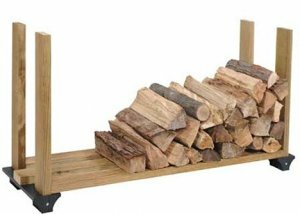 They make a number of systems that make use of easily accessible 2x4s, and one of those systems turns 2x4s into a handy firewood rack. Oddly enough, or maybe just showing smart business practices, the 2x4 Basics fireplace rack components appear to be the same as those used in their shelving system. The components are made of durable structural resin and come with a lifetime warranty. Assembly of the fireplace rack looks as simple as simple could be. 2x4s in the system require only 90 degree cuts, and besides a saw, the only other tool needed is a screwdriver. All the hardware you need to build a complete rack is included. The length of the rack can be customized to fit your needs, and can be stretched up to 8-feet. If you feel the need to separate your wood, a second kit can be added on top to add additional wood stacking space. The basic kit costs around $13, but $30 gets you the ShelfLinks system which can be used to make up to three firewood racks.